Today was the first "full" day for our three-year-old class. They did wonderfully. They all arrived bright-eyed and bushy-tailed and ready for some fun. It was almost like they have been here before. We only had one who was a bit upset, but for probably about one minute. I didn't have a major focus for today. Our first day is pretty much just getting to know them, and them getting to know us. We did talk about making new friends and treating each other with kindness. We made a class project just to work together. We made a friendship wreath. I had cut a piece of large paper and drew a circle on it. Then I had the children use an ink pad and stamp their handprints to make a wreath. We hung the wreath on the door to welcome the parents as they arrived. The book we read today was, "How Do Dinosaurs Play With Their Friends? 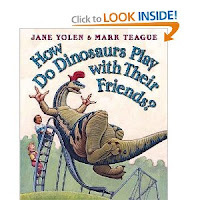 ", by Jane Yolen and Mark Teague. I love all the "How Do Dinosaurs..." books. Some of the children finished their Me Posters and shared them with the class. These are great to have in the room at the beginning of school for reassurance purposes. They also had lots of fun with the marble maze today. It's always so cute to watch their faces as they send the marble down. The smile slowly spreads across the face as the marble travels down the path. Finally, I was very impressed with their use and care of the manipulatives. Of course, they didn't all put them away when they were done, but some of them followed suit very well. We finished up the day having a blast on the playground. Friendship wreath is adorable! Love the idea! The hand painting wreath shaped like really symbolizes friendship. I like the idea. It is very meaningful. Your students are sure enjoying your class with all the fun activities you are providing them. I am just curious on how you handle three year old kids in class?